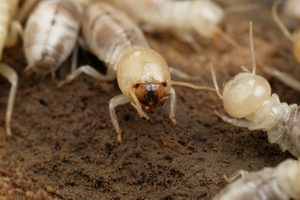 These are Mastotermes darwiniensis worker termites. The giant northern termite is a large endemic species which lives in colonies in trees and logs in the tropical areas of Australia. In native environments, population are generally small but in built up areas nests can become very large. This species is known to cause damage to wood and wood products and is one species that is known to invade houses causing severe structural damage.